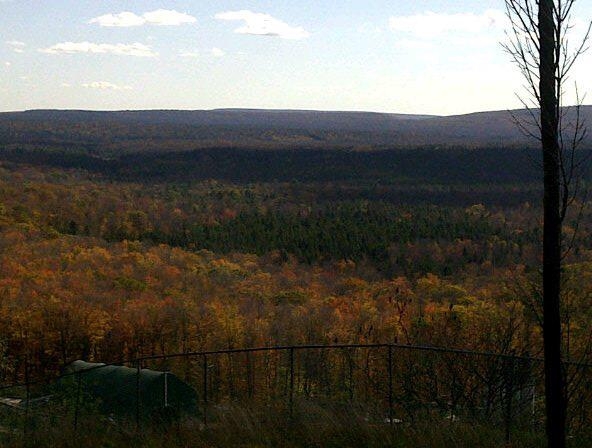 Rick's Pocono Blog: History About The Glorious Pocono Mountains! Thomas Penn was the son of William Penn. These men are both very important to what the Pocono Mountains has become! Thomas Penn finangled the land we know today as the Pocono Mountains out of his father's Treaty with the Deleware Indians in the Walking Purchase of 1737. This was the Very Beginning of a big Part of Pennsylvania. It was the Beginning of the Poconos! Stretching across Monroe, Pike, Wayne, and Carbon Counties, The Pocono Mountains are actually a Southern extension of the Cat Skills, and it seems the descendants of the Cat Skill's Resort- Goers of the 50's have claimed The Pocono Mountains of Pennsylvania their territory. In more Recent Years, The Pocono Mountains has become one of the Number one Spots in Pennsylvania for Outdoor Fun, Vacationing, Camping, Skiing, and Casino Fun! With 2,500 Square Miles of Forest, Hills, and Waterfalls, The Pocono Mountains has grown to be a Nation Wide known Area that brings in tourists from all over The Nation and World! In Summer, Family and Friends get soaked on White Water Rafting Trips, Spend the day at one of the Waterparks, or go for a Swim and a Picnic down by one of the lakes in the Perfect Private Communities! There are more then 100 types of trees in the area, and in the fall the brilliantly colored leaves are a scenic haven for Driving or Hiking Trips! You always need your camera in the Poconos! Winter in the Poconos is all about Skiing, Snowboarding, Tubing, Ice Skating, and all your Favorite Winter Sport Activities. Spend the day at the Slopes at one of the Legendary Pocono Ski Resorts! Spring time is when the leaves start growing back, the Bears come out of hybernation, and the Forests come back to life! It is the number one Season for Golfing in the Poconos! Many Resorts and Communities have professional 18 Hole Golf Courses, Tennis Courts, Volleyball Courts, and much more! Pocono Mountain Lakes Realty looks forward to helping you find your Perfect Pocono Mountain Home! We are Pocono Mountain Experts so come all Second Home Buyers, Full Time Buyers, and Vacation Renters!